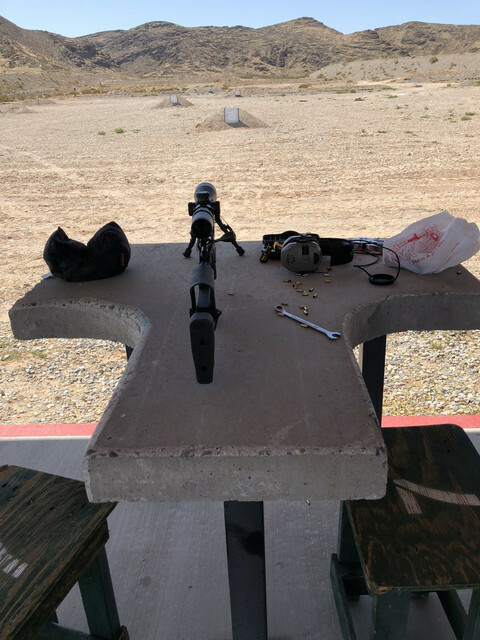 Hit the Country Club today with a new Ruger Rimfire. Definitely the most fun I’ve had shooting in a long while. There was a guy out there so I didn’t get to walk out and hang paper. So I sighted in on some chicken or duck at 75/100. I didn’t bore sight so it took a couple shots to get on. It was about 6 mils from the bottom with a 30MOA rail. I wanted to save the wolf, Lapua and, fed match ammo for some paper but the armscore and CCI standard seemed to hit where I was aiming. I’m pretty impressed with the vortex Diamondback. I mean it’s nowhere near as clear as my 4.5-27 but it was 1/6th the cost. I was shooting some boars (I think) at 200 at 12x and the glass did it’s job. I like how on range 7 the cover extends past the benches so there’s no need for the sunshade. Next time out I’ll see how she tracks. I did notice those little 22s take a lot of elevation between 100 and 200. I got the scope because it has the ebr2c reticle and it’s FFP so it’s like every other scope I own. All in all the 22lr is way more fun then I thought it was going to be. We seem to have more fun shooting .22lr and the air rifles when we go camping. Maybe it helps that it's cheap. I don't know, but we have a blast. That scope has nice specs for $400, would be cool on a budget centerfire setup. I like range 7, nice and quiet.... the amount of people and the guns, lol. Only problem on centerfire I see is the lack of total adjustment. I mounted the scope there thus the wrench. As you know my medium rings didn't work so I "borrowed" a pepr mount from another rifle. Lol I picked up 5000 rounds earlier today. I did the same Thursday (5k)... Never can have too many 22lr on hand seeing how fast one can go through them. Plus ordered a little over 2k in addition to that Sunday (match grade stuff that is affordable that this thing seems to like). Price per round verse smile on face... Can't beat 22lr. I'm going to guess we all graduate quickly from 22 to powerful rounds. But sooner or later we migrate back to 22 LR. I think for 1 reason, we like to shoot & hit the target. & with the 22 we can shoot longer for less money without the pain. Just today I was target shooting 357. After 50 rounds holding walnut & steel my hand was buzzing numb. Just my opinion. Dont get me wrong I love my 6.5CM and can shoot it all day as long as I have ammo. It takes a couple hours to load up 50+ rounds though - that and everything I have to lug to the range with it - is the issue. I can throw 100s of rounds, the rifle, and one bag in the truck, and still have everything weight less than a 16lb rifle. I don't need to bring targets, stands, stapler, tools, etc. I like the simplicity. I didn't go from 22 to centerfire like most. I went .223 to .308 to 6.5 to .338LM to 22lr. Move over to the steel on 7D. You have 1, 2, 3 and 4moa targets at 25, 50, 75 and 100 yards. There are also 2 larger targets at each of the shorter distance to practice positional or for new shooters.150 and 200 yards has a few larger targets at each distance. Have never been without a .22 LR. When young and poor, I had a .22 and a .223. When in the Navy, I had a .22 and a .45. After, I would add various, but the .22 is a mainstay. 10 cents a round for a while was insane, but everything was relative then. I hedged my ammo pile a bit then, but turns out I didn't have to. Was still cheap(er) insurance. Even the good stuff is back to normal pricing and supply. I hope the ammo companies have learned a lesson and just stay on double shifts through the good times; just buy bigger warehouses. It'll be worth it. I'll check that out. I've only been out there 2x. Once I noticed that a lot of the targets had locks on them. I'm assuming their used in matches. Last time that's where a guy was shooting prone on D so I shot on B. The locked down targets are for matches only. There are still 32 other targets all painted red that are setup permanently for members to shoot 22lr only. Then you saw the paper target boards on 7C at 25, 50, 75 and 100 yards. Just ask for a cease fire and you can setup your paper targets on those boards. That range is totally setup to do whatever work or testing that you want with your 22lr. Bring out your own red paint and repaint the steel during a cease fire also to better see your hits.